During an evening walk in my wheelchair at the neighbourhood and across the Blue Cross road in Adyar (adjoining Besant nagar) I capture this piece of fence that I find it to be wild. 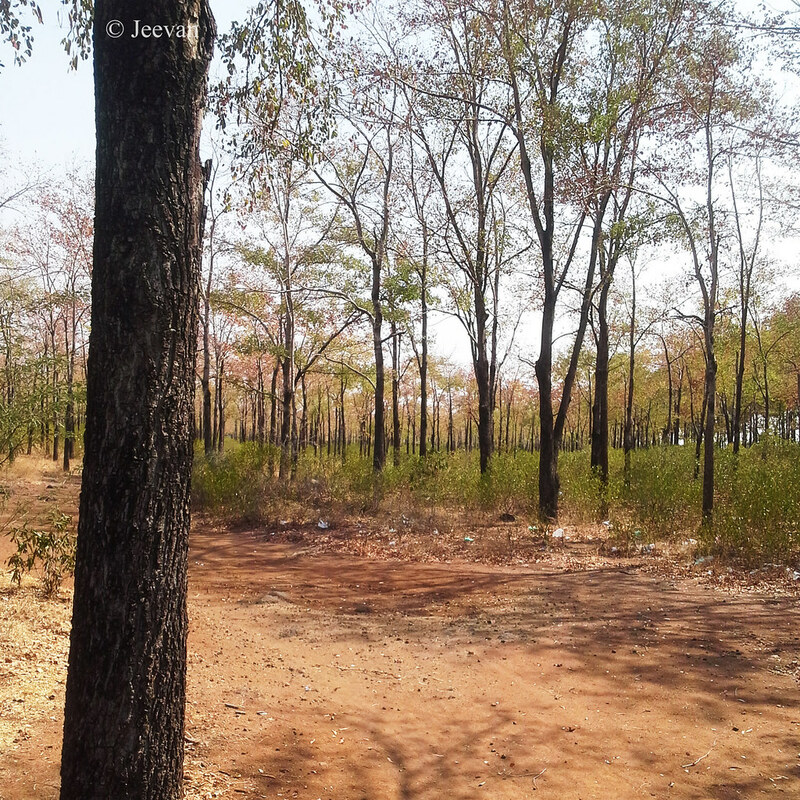 The entire road has been fenced one side that belongs to former Besant school (now The school KFI) and was covered by canopy of trees. Sadly many trees fallen on this road in recent cyclone Vardha, but still the road continues to hold charm by greenery and shadows. I also found some little flowers bloomed pretty in pink covers some area of the fences… and I do think this is some kind of wild flowers thrive on its own. I love traveling and traveling on road-less travelled is my favourite. Wherever I go I look for places beyond the regular and I find it more exciting than what has been explored by many. Though many perhaps like taking such travels but don’t give much thought as it keeps them away from the comfort. But I am someone always like adventure and try to venture places that not many chose to travel or ready to lookout for. During my stay at Thandikudi, near Kodaikanal, I explored a route that was less travelled or abandoned since alternate and more comfort roads was developed. 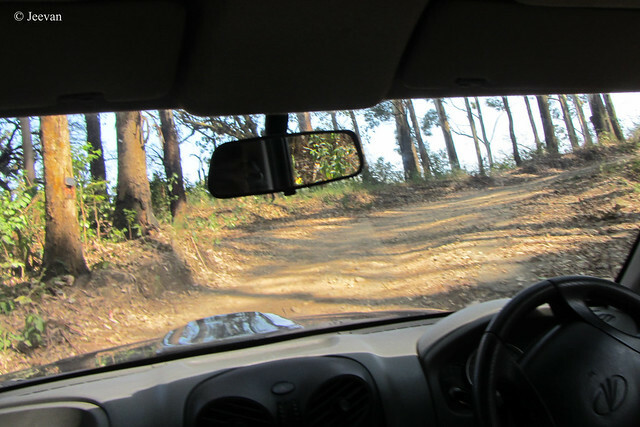 Though it was the first road to Kodaikanal many unknown about it. The road that slides before Perumal Malai on the main road to the Kodaikanal, leads to the mango city Periyakulam via Adukkam village and Kumbakkarai waterfalls at the foothills. From the time I know about this road, a short route to Kodaikanal when going by Periyakulam or Theni, I want to explore it and travel as much possible. I learned the road up to Adukkam village (half on the mountain) was travelable though the road wasn’t good and worst beyond that, we tied our best and it was possible only because of our Scorpio (SUV). For the most part of the road was unpaved or washed away as it wasn’t relayed after it was originally laid by the British. And the road is narrow which means facing a vehicle would make either take reverse or adjust space for the opposite to pass. 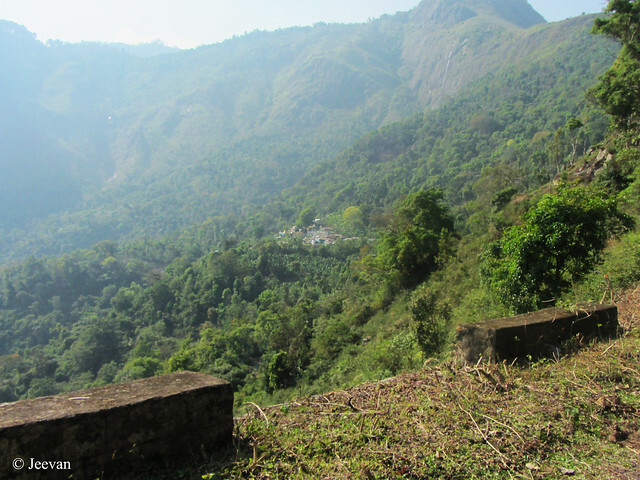 The view of narrow winding road from the Adukkam village towards Kumbakkarai falls, which we didn't take. The road wasn’t narrow but also potholed for large that any car would get bottom hurt unless it was an SUV or height ground clearance vehicle. The people from one of the vehicles (Hyundai Santro) that was coming up from Periyakulam warned us not to go further or beyond Adukkam as the road was in bad shape but still we managed up to Adukkam and turned back thinking it was our limit. Though few jeep drivers encouraged that we can go all the way to Kumbakkarai, as the villagers have cleared the road lately, we didn’t mind to go beyond and since it was late afternoon we don’t want to take risk and turned away with the view of winding lane down the hills. 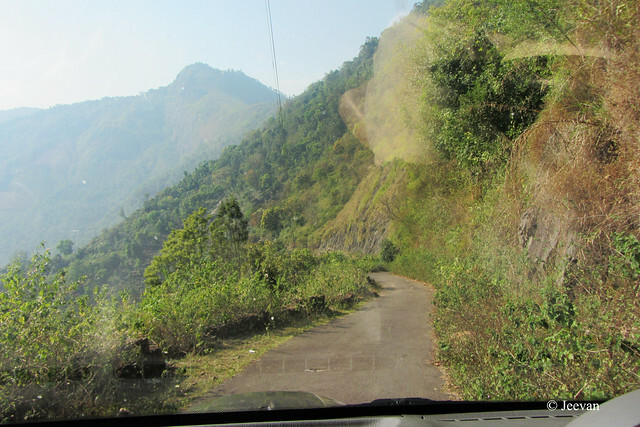 This road beholds views that are pristine and most part of the valley and mountains seem untouched by many. 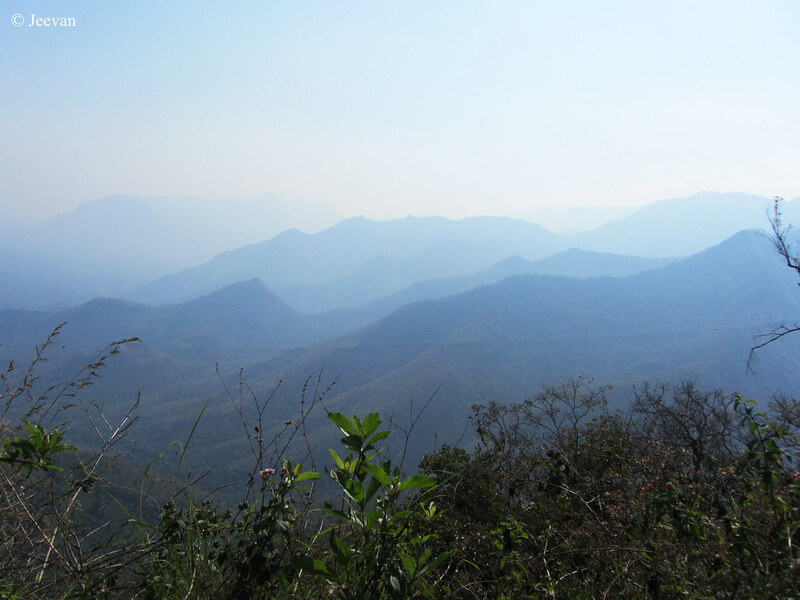 Being an initial and pretty old road to Kodaikanal, which seems to be laid in late 1800s or early 1900s, continue to hold the charm as most part of the route was undamaged by the tourism cottages or buildings. 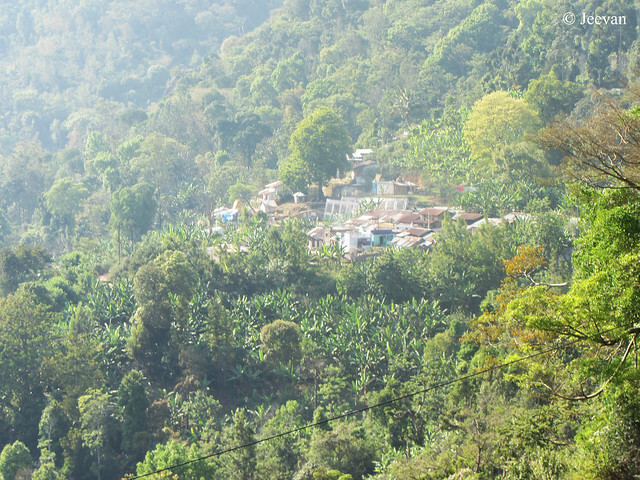 But I got to see few beautiful farm houses and bungalows and a stretch of coffee and orange plantations en route to the Adukkam, from there till the foothill is quite wild forest. 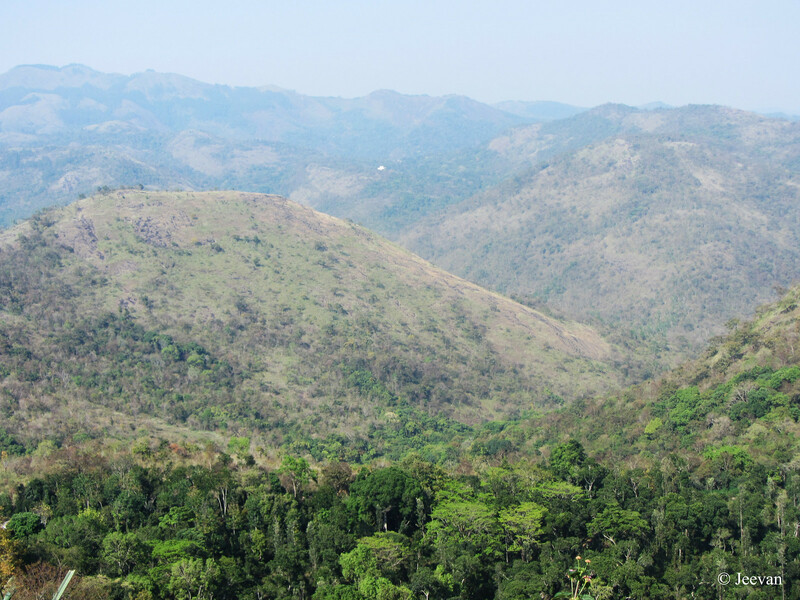 Adukkam isn’t a big village and it comes to view few kms before on road resembling a small nest on the laps of mountains. The red coffee beans, what the old woman said no to capture! 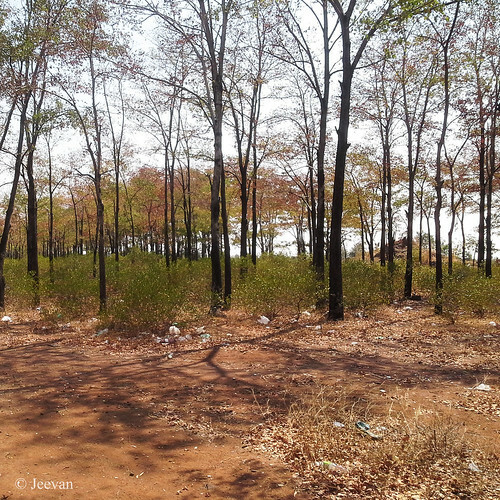 A forest is recreated near Trichy on the Chennai - Trichy National Highway. The 35 acres of the forest landscape (near MR Pallayam) is supposed to transform into Elephant Rescue centre, the project, first of its kind was initiated by the former government to provide medical care to sick elephants belonging to temples and the individuals. But it was not fully implemented by the following regime. The objective of creating the centre in the state is to provide complete medical treatment to sick elephants. The funds allotted in the first instalment from the government have been utilized… and the project is waiting for further funds from govt. One traveling between Perambalur and Trichy could come to see the plantation of trees and a damaged structure of an elephant’s statue marking the project. Today is International Day of Forests, a day that was designated to raise awareness of the importance of all types of forests, and trees outside forests, for the benefit of current and future generations. 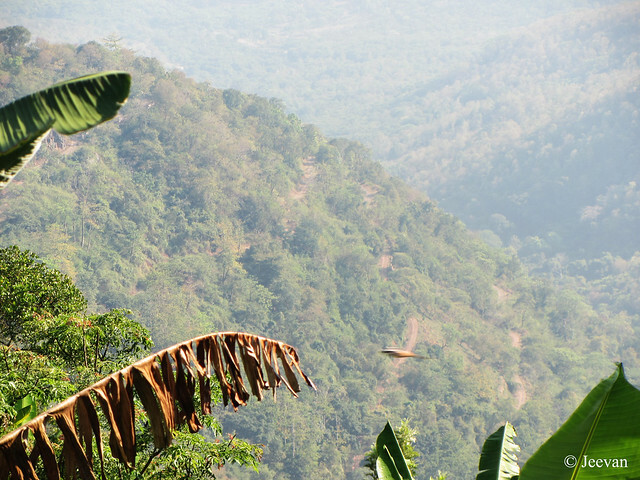 Countries are encouraged to undertake efforts to organize local, national, and international activities involving forests and trees, such as tree planting campaigns, on International Day of Forests. Here’s RGB Monday to keep away your Monday Blues and make feel colourful and yet cheerful! And this Link-in feature invites your colourful photos with the content of RGB – Red, Green, and Blue. 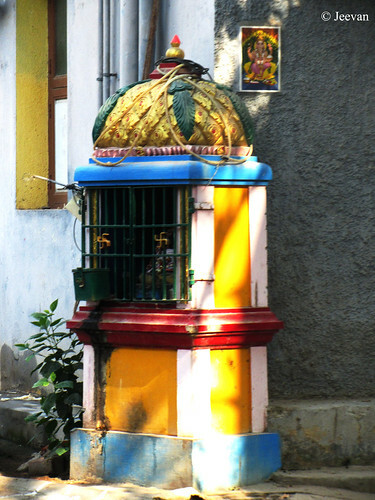 A small shrine of Ganesh attached to a house in our street on the intersection. People believe that having a Ganesh shrine or idol on an intersection keeps away misfortune. I find this shrine colourful to fit my RGB Monday series and thus the post. 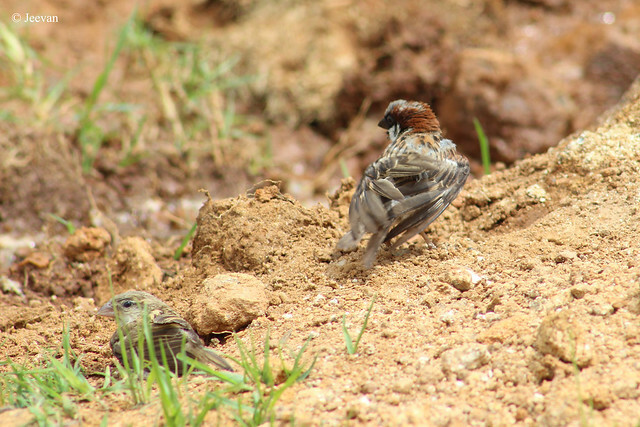 As you know House Sparrows are speedily disappearing from the earth and esp. 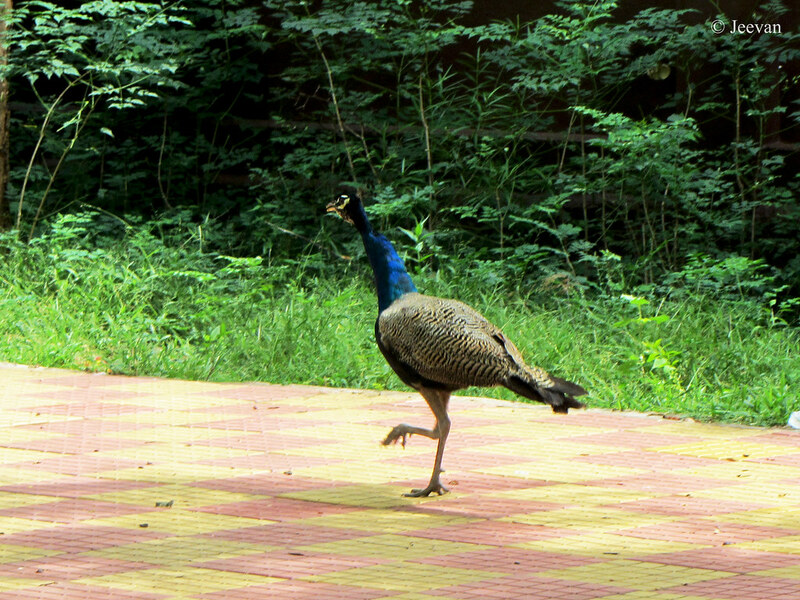 in cities like Chennai the House sparrows almost lost their little foots. Though the reasons for disappear of sparrows are apparent, but still the continues rise of radiations, and modern architecture and lack of fodder pushing them to the brim. But glad I was able to grow up enjoy watching the little sparrows forage on the balconies and portico and mostly perching on the wires frequent the doorstep and sometimes into the home. I don’t remember when I last saw the House sparrows twittering and leaping off the balcony and attempts to enter our home but sparrows continued to live at our grandparent's home until lately. It used to wonder when most of the places turn down to sparrows, my grandparent's house (at the neighbourhood) continued to be their abode. Though they shut down their milk business and rearing cows in early 20s, with the help of stalks and hay what the sparrows used to build nests within the barn and the corners of drainage pipes, and used to their noisy twitter's, there stay continued the same way even after things turn difficult is really amazing. I supported my grandmother providing feeder to the sparrows but they are forced to clear their space to build a cosy house for my grandfather. Hope the sparrow stay somewhere at peace. Relevant to March 20, the World Sparrow day, a day that was designated to raise awareness of the House sparrows whose populations is on threats, I like to share few photos on the House sparrows that we shot at a remote village in Kodaikanal. During my travel to Western Ghats, and mostly to Kodaikanal I see sparrows continue to rattle close to the human habitations. 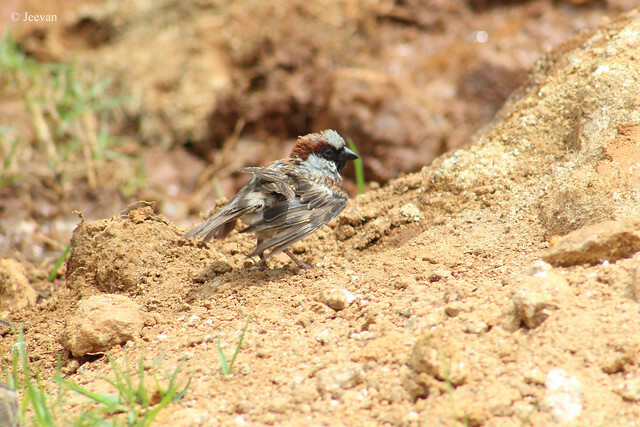 But I was really amused to watch a bunch of House sparrows enjoying close to a spring off the road and through there were many we couldn’t focus on the all and you see a male House sparrow in the images except the last one that has both genders. 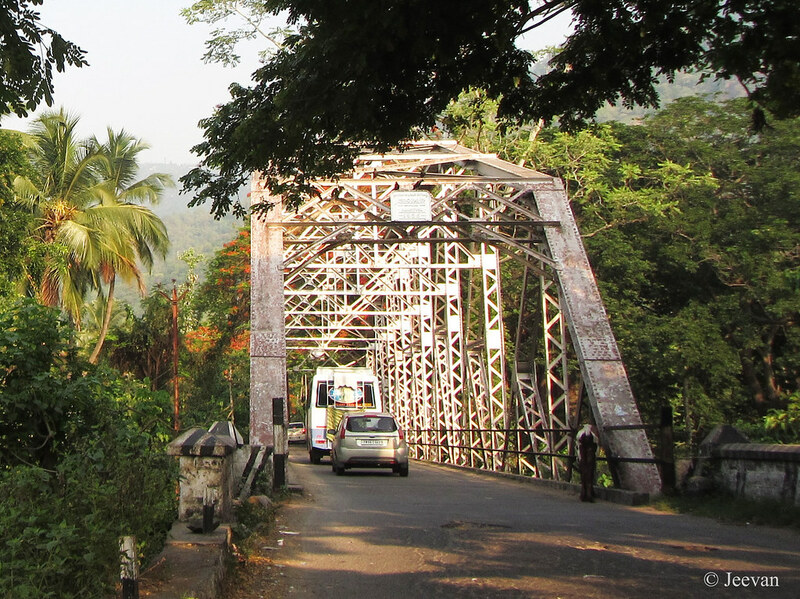 During my visit to Ooty in 2014, I come across the steel bridge at Kallar on the foothills of Nilgiri. 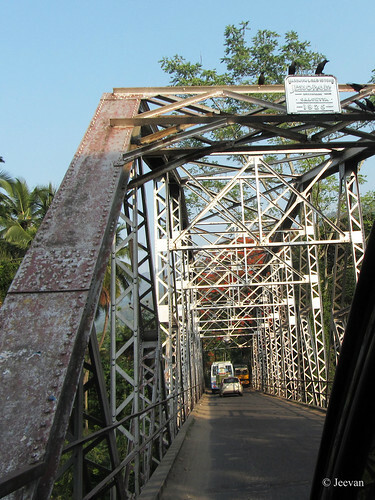 The Kallar Steel Bridge on the Mettupalayam-Ooty main road was built in 1925 by Jessop and Company, following a wooden bridge that was earlier washed away in 1891 floods. In 1894 a masonry bridge was constructed but in 1925, the steel bridge with a capacity of 10-tonnes was built alongside to accommodate more vehicles. The ruined masonry bridge was demolished lately and to give more way to vehicles an addition bridge is come up right beside the steel bridge, but I am not sure will it be attentive like the steel bridge. 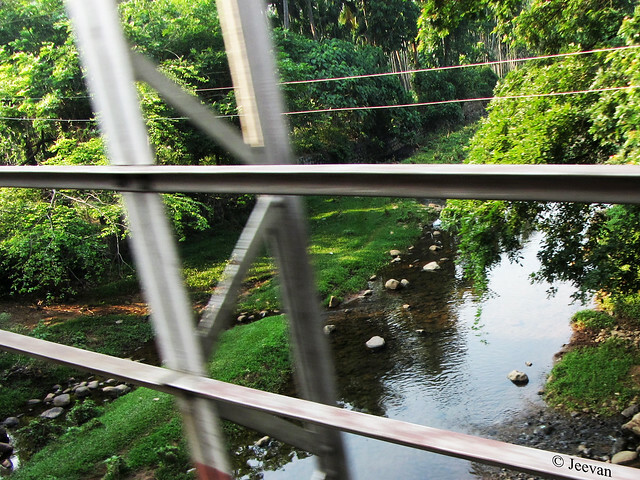 I loved taking photos on the steel bridge from the moving car and in the morning light the bridge was delight to watch and the Kallar River passes beneath. Having plan for visiting Nilgiri in about a month, i hope to explore more on Kallar area while staying at Mettupalayam. Ps. The haiku is an inspiration from the photo i shot during a evening walk (in wheelchair) last week. During a visit to Thiruvannamalai, popular for the Annamalai temple and hill, couple of year back, we come around the Girivalam Pathai (the road round the hill, where devotees take one full round during the full moon day, alike today) to have our lunch that we brought from home. 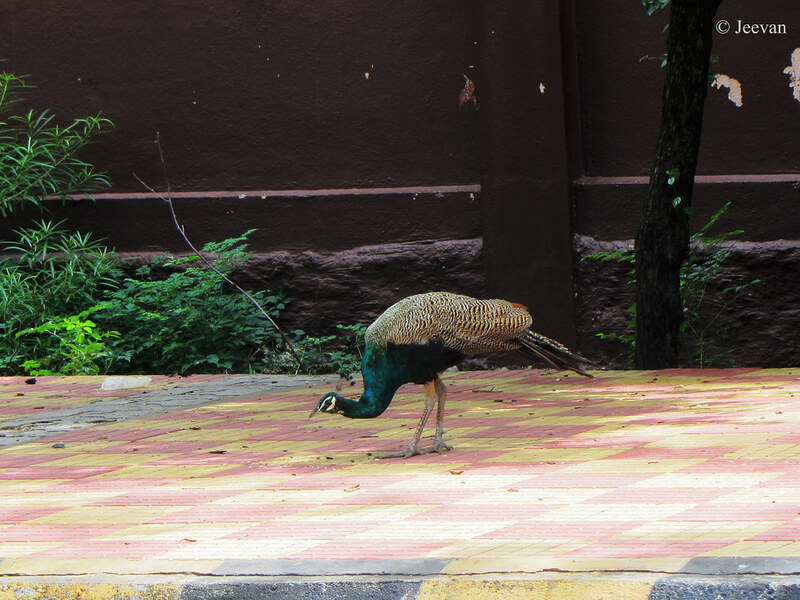 Parking the car aside the road and shadow of the trees, we find many sadhus lying here and there on the footpaths and benches that rest alongside the road (to help devotees on the walk) and while relaxing after the lunch I get to see few beautiful peacocks and following one I got the pictures below. Last year during the visit to Kumbakonam and while coming from Ariyalur we stopped at a village and I just came close to this yellow flowering shrub grew in front of a house. And the gate came into the image without an intention of shooting it and it gives a neat look to the house and I also liked the design. 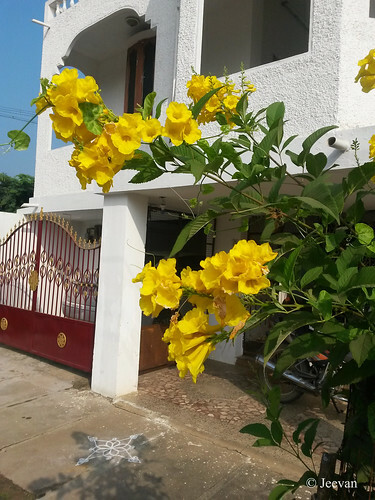 The yellow flowers, named as yellow bells aka yellow trumpet bush has become a trend in Tamil Nadu and many people has been planting this shrub esp. in front of the houses. 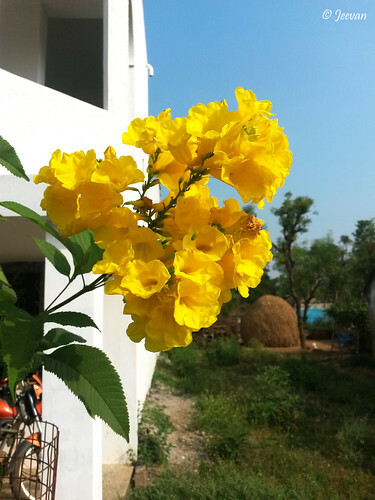 Apart for the ornamental use, people started to grow these mainly for the purpose of Vastu (a traditional belief of bringing harmony into the home and Vastu means dwelling) but I like this plant for its charming and bright yellow blossoms. I really want to have this plant for me and will try to get one soon. Yellow Bells are a perennial shrub in the trumpet vine family that is native to the Americas and it is heat and drought tolerance, vigor and pest resistance. The yellow flowers are 2” long with trumpet shape and hangs in showy clusters at the branch tips and forks, bending the wigs into arches give the name Yellow Bells. 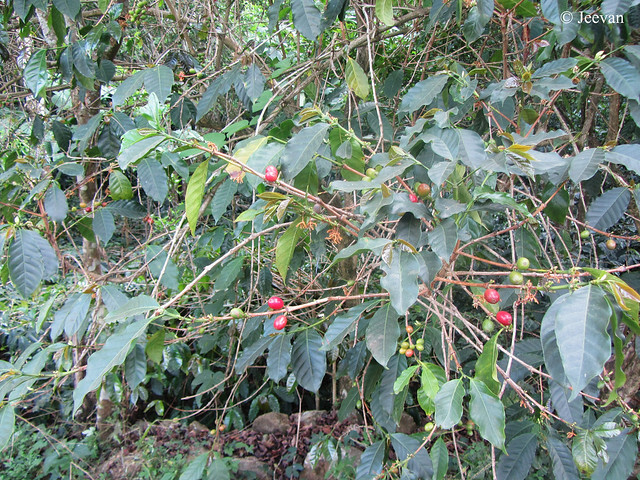 It has a very long flowering season, from early summer to late fall; the shrub reaches 15-20 feet height and attracts bees, butterflies and hummingbirds for its flowers. who embraced her at night. who left her half asleep. 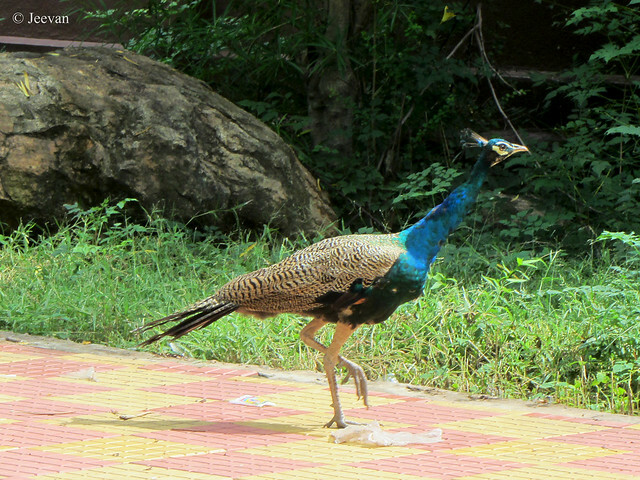 The image has been cropped from the picture of a provision shop; I shot at Thiruporur on the outskirt of Chennai. p.s. 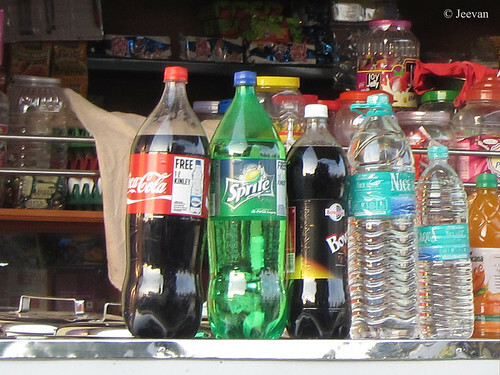 It seems the merchants of Tamil Nadu have decided to stop sell foreign soft drinks like Pepsi, Coke, Sprite, and Miranda… from the March 1st. The decision was taken by the traders association of Tamil Nadu following the pro-jallikattu protest and as a move towards boycotting foreign products. Not only that they keep front the decision to prevent foreign products but argues that soft drinks are unhealthy to consume. Though I agree with the second one that soft drinks aren’t healthy and suggestible to drink, but if they decided to avert the overseas products it should apply to all and not alone on soft drinks which is least per cent. And I really want to ask those protests against foreign products and if they are sure about the decision will they prevent the millions of people working in MNC’s and give up the economic development support by this industry. I see there’s both good and bad in any kind of things and many foreign productions has become lifesavers for many and in the globalised world we can’t quit things completely unless they aren’t good for health or country and enter the policies/rights of nation. How many iPhone fans in India? Is iPhone or apple is Indian origin? Soft drinks are unhealthy and it should be boycott only on this basis. There is an unclear politics behind these and I can’t go inside it without a moderate picture. There’s a thought generally that dogs and cats don’t come or go together and making it approve I haven’t seen them roaming together and at same time not dog chasing a cat. But I don’t want to take what’s happening with house dogs alike our puppy Maya who don’t like cats and not only cats, she also chase other dogs when seeing them. Just having her as example I couldn’t come to a conclusion. 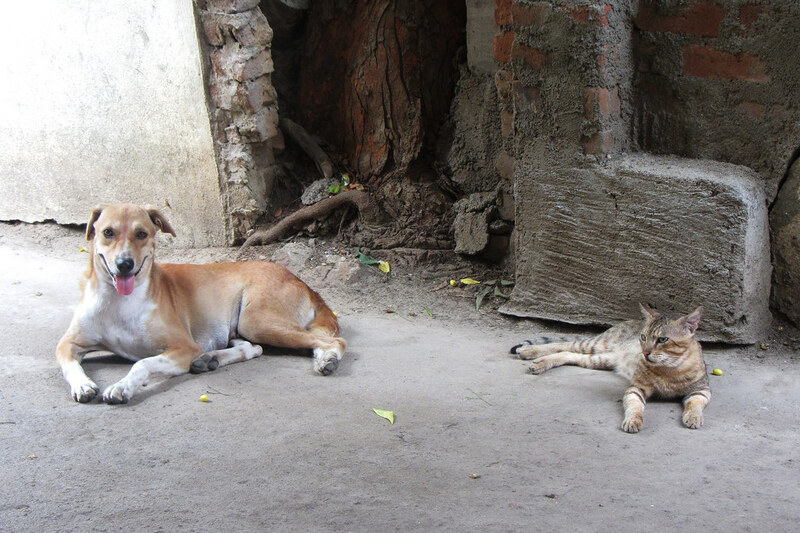 But breaking the general thought I come to a scene where one of our stray/street dogs and cat lay side-by-side in front of our house. 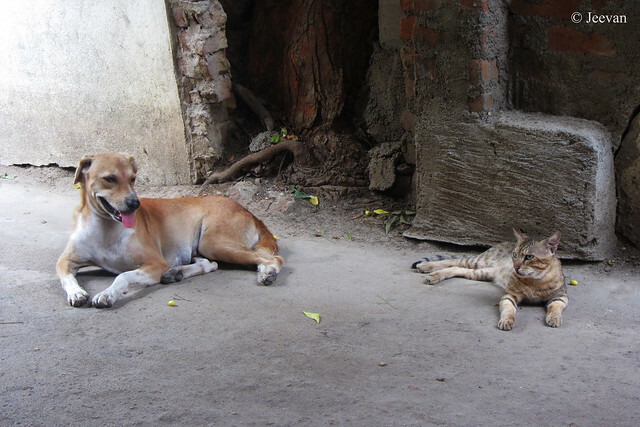 I shot the scene right outside my doorstep, with the dog on the left and cat at the opposite relaxing under the Neem tree while facing each other. I’m seeing both of them for some time now and there’s no wonder they decide to take rest together, because both are very patient animals and ever hurt anybody intently. But the dog has bitten a boy lately when he went close to her cubs just to take a ball! I think it is a precaution any animals or birds used to take. And the cat has almost become our house cat as he always lazy around and sleeps mostly on the portico. 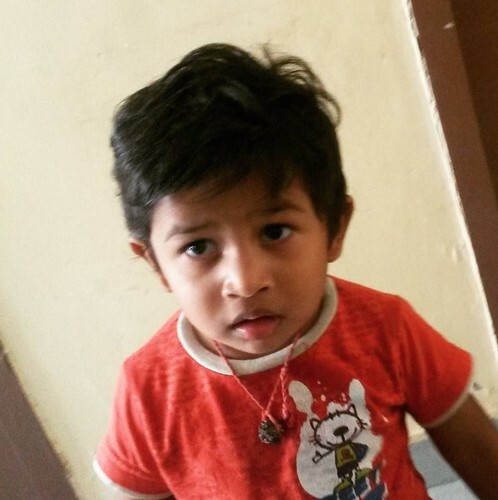 Achu’s father was transferred to Bangalore and he will be leaving us in a week or some time. For about a year I have been watching him (and now he’s 2 ½ age), he’s been growing though best parenting I could say for sure. He’s very quiet and approach things at easy and patience. I really amaze at his attitude even at this little age, which is indeed comes from his parents who has been friendly and down to earth. He never took anything from others and even as friends he refuses to take anything from us unless showing it to his mom and we never discouraged him on this front. His parent’s trust us, as well as Achu agree to be carried away only by mom. He developed an attachment very soon with mom and even our puppy Maya become familiar with his sounds and smell; almost maintain silence whenever he enters our home freely. We even unlock the little gate when Maya is tied so that he don’t find difficult in opening and he is fearless coming close to Maya and she’s also forceless. 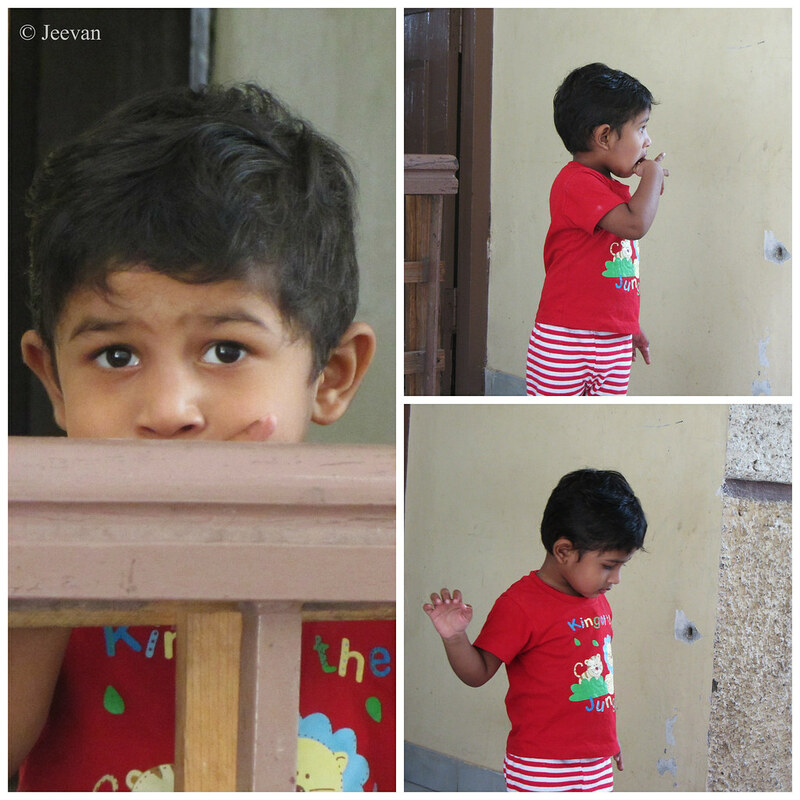 Achu is a great observer and watches things patiently and try to apply it through his innocent pace. Even my relative’s kids who has the rights to call me mama (uncle) doesn’t calling or visiting me but each time he utter the word, with sheer innocent, I quite feel connected and content. I actually feel Achu’s approach fills the crave for a kid at home and we treat him as our own kid and he keeps calling mom (as grandma) and take her to his house and ask to sit-down. The entire scene used to be sweet and his parents watch his attitude with admiration, and if my wheelchair ramp is laid at the doorstep he call me to come down to play with him. 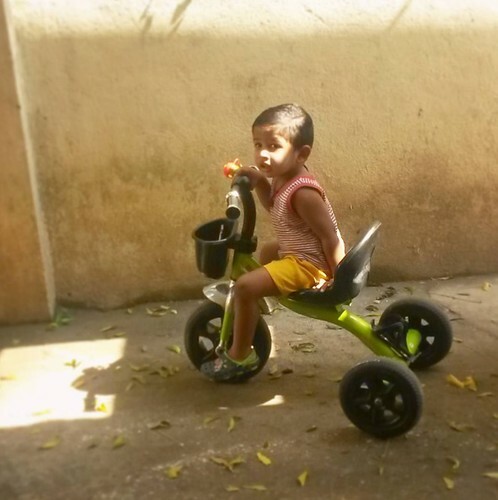 He likes seeing me coming up/down the ramp (and he calls this swwing, the sound of sliding) and then he used to bring his cycle and try the same. He note how I put into the wheelchair and how footrest and board is placed and try to do same. He likes bison (Indian guar) which he had seen during his trip to Valparai and he wants me to show bison on laptop and leaning on me he keeps asking for other animals and birds. The way he takes rights on me truly make me feel happy and thinking now, that he will be away soon I would really miss him, as well as my family. His innocent giggle, smile and cry for silly things make me watch light-hearted. And something very sweet about his cry was he sound like a newly born. Absolutely he’s a gifted child and I am really glad to share his giftedness though their stay as next door resident. 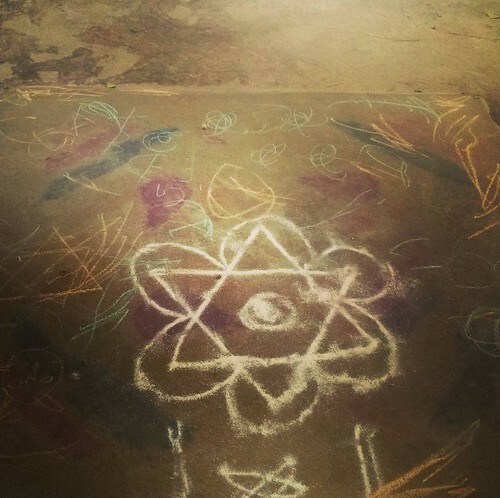 Like I said above, Achu’s parents are very friendly and used to share their happiness and grief with us and only because of their pressure (to the landlords) a ramp was built in front of the house to prevent water entering the house. It was an unexpected move even for them and they too feel unhappy for gonna be parted. I know nothing is stable in this world; and this move too will have something better for both. Let’s hope.